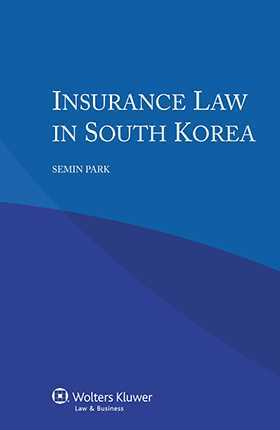 Derived from the renowned multi-volume International Encyclopaedia of Laws, this book provides valuable practical insight into both public supervisory legislation concerning insurance and private insurance contract law in South Korea. An informative general introduction surveying the legal, political, financial, and commercial background and surroundings of insurance provides a sound foundation for the specific detail that follows. Succinct yet eminently practical, the book will be a valuable resource for lawyers handling cases affecting South Korea. It will be of practical utility to those both in public service and private practice called on to develop and to apply the laws of insurance, and of special interest as a contribution to the much-needed harmonization of insurance law. Part I. The Insurance Company. Chapter 1. Access to Business. Chapter 3. Supervision for Asset Management. Chapter 4. Sanctions against Insurance Companies. Chapter 5. Dissolution of Insurance Company. Part II. The Insurance Contract-General. Chapter 1. Features of Insurance Contract. Chapter 2. The Elements of Insurance Contract. Chapter 3. Conclusion of Insurance Contract. Chapter 4. Duty of Disclosure. Chapter 5. Effect of Insurance Contract. Chapter 6. Variation of Insurance Contract. Chapter 7. Insurance for Benefits of Third Party. Part III. General Theory of Non-life Insurance. Chapter 2. Elements of Non-life Insurance. Chapter 3. Effect of Non-life Insurance Contract. Chapter 5. Change and Extinction of Non-life Insurance. Part IV. Common Theories of Personal Insurance. Chapter 1. Definition and Type of Personal Insurance. Chapter 2. Nature of Personal Insurance. Chapter 3. Stated Matter of Personal Insurance Policy. Chapter 4. Reduction of Insurance Money by Previous Illness. Part V. Property and Liability Insurance. Chapter 2. Type of Automobile Insurance. Chapter 4. Stated Matter in Automobile Insurance. Chapter 5. Period of Coverage. Chapter 6. Bodily Injury Liability Insurance I (Compulsory Insurance). Chapter 7. Bodily Injury Liability Insurance II (Non-mandatory Liability Insurance). Chapter 8. Property Damage Liability Insurance. Chapter 9. First Party Property Damage Insurance. Chapter 10. First Party Injury Insurance. Chapter 11. Accident Insurance by Uninsured Car. Chapter 12. Transfer of Automobile. Part VII. Insurance of the Person. Part VIII. Private Insurance: Industrial Accident Compensation Insurance Act. Part IX. Insurance Intermediaries and the Insurance Contract. Chapter 5. Law of Establishment and Supervision of Insurance Intermediaries.